Four months ago, a very large earthquake occurred beneath far easternmost Russia, but not even the locals paid it much notice because it was far away from everyone—609 kilometers (378 miles) straight down from a point in the Sea of Okhotsk. Within the hour, though, seismologists around the world were buzzing because it appeared to be a record-setting event. A paper published in Science today confirms that the May 24 Russian quake was the largest deep earthquake ever recorded, and also shows that it was quite different from the previous record-holder, a 1994 event 637 kilometers beneath Bolivia. The world's deepest earthquakes don't make much of a ruckus in human terms, but seismologists are deeply interested in them because they're not supposed to happen. Rocks soften as they heat up, and at depths below around 50 kilometers they're generally so hot that they flow instead of breaking. No rupturing means no earthquakes. That's why the San Andreas fault just peters out at its base, and it's a major reason why the Earth's outer shell can slide around in continent-sized pieces called tectonic plates. Nevertheless, somehow certain rocks can rupture and release stress—creating earthquakes—as deep as 700 kilometers, the boundary between the upper and lower mantle. So deep quakes are potent clues to interesting science in a part of the earth where we have almost no direct evidence. Deep quakes happen where plates are being pulled down into the mantle in the process called subduction. Subducting plates are naturally much colder than the rock around them, so the general thinking is that they remain brittle to a greater depth. But the details are still puzzling. In the Science paper, a team including UC Santa Cruz's Thorne Lay and his graduate student Lingling Ye assigned the 2013 Russia quake the same magnitude, 8.3, as the 1994 Bolivia quake. But in fact it had one-third more energy, just not enough for an 8.4. So that was a nice thing to learn. The team relied on the excellent data from the USArray network, a decade-long experiment that's been stationing large groups of seismometers around the country in a gigantic version of a doctor positioning a stethoscope on a patient's body. Here's a snapshot of the seismic waves from the 2013 quake sweeping from Russia across the USArray. From the Recent Earthquake Teachable Moments page of the IRIS consortium. This is one frame of an animation of the 2013 Sea of Okhotsk earthquake records. The total up-and-down ground motion was about half a millimeter. Ye and Lay's team mapped the deep rupture as a large, nearly horizontal fault inside the subducting plate. They were able to determine that the upper side of the fault slid and scraped over the bottom side more than 30 feet (9.9 meters) in 30 seconds. They detected only a few small aftershocks, but that's common in deep earthquakes—the long-lasting aftershock sequences familiar in shallow quakes are muffled in these deep-seated rocks. Rupture zone of the 2013 Sea of Okhotsk quake mapped in pink; each ring inside the outline represents 2.2 meters of slip. 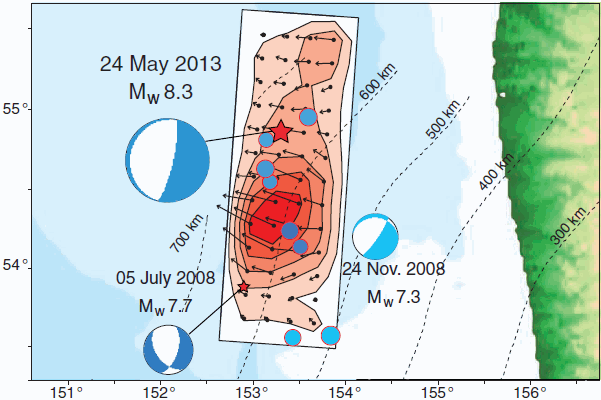 Blue dots are aftershocks, each about magnitude 4. Large round symbols show the orientation of the slip motion for the 8.3 quake and two earlier earthquakes in 2008. Dashed contour lines show the top of the subducting Pacific plate. Arrows show the motion of the rock during the rupture. The land on the east is the west coast of the Kamchatka Peninsula. From figure 1 of Ye et al., "Energy release of the 2013 Mw 8.3 Sea of Okhotsk earthquake and deep slab stress heterogeneity," Science vol. 341, pp. 1380-1384. Compared to the 1994 Bolivia quake, the 2013 Russia event was much louder—that is, it sent out more of its energy as seismic waves. The speed at which the rock ruptured was four times greater in Russia than in Bolivia. And the amount of stress released at a given spot was much smaller in Russia than in Bolivia. In these respects the Russia quake resembled shallow earthquakes. These differences, the authors reasoned, come from differences in the two subducting plates. In Bolivia the young, relatively warm Nazca plate is subducting beneath South America whereas in the Sea of Okhotsk the subducting Pacific plate is very old (about 100 million years), making it much colder and thicker. In Bolivia more of the earthquake's energy went into friction and heating—perhaps even melting—of the rock, but in Russia the colder, stiffer rock passed the energy through as vibrations. The authors studied one magnitude-6.7 aftershock of the Russia quake that acted very much like the Bolivia quake: its stress drop was dozens of times as great as the mainshock. They concluded that this points to a mixture of structures in the subducting plate rather than a homogeneous slab of rock: "The stress drops found for the 2013 mainshock and large aftershock suggest preexisting zones with strong and weak regions, likely inherited from shallow faulting" earlier in the history of the plate. "Weak" means brittle, what we would think of as strong, solid rock, and "strong" means relatively soft rock that prefers to warp slowly, with lots of friction, rather than rupture quickly. This points to a picture of deeply subducted plates that are a heterogeneous mixture of weak and strong patches. In a place like Bolivia, strong patches outnumber weak ones, and the opposite is true in a place like the Sea of Okhotsk. That still doesn't tell us exactly what kind of rupture happens in these very deep earthquakes. The kind of simple cracking we see in surface quakes is forbidden by the physics down there. We think that "phase transformations" of minerals are involved, in which the atoms reconfigure themselves into a new crystalline arrangement better suited to the high-pressure environment. 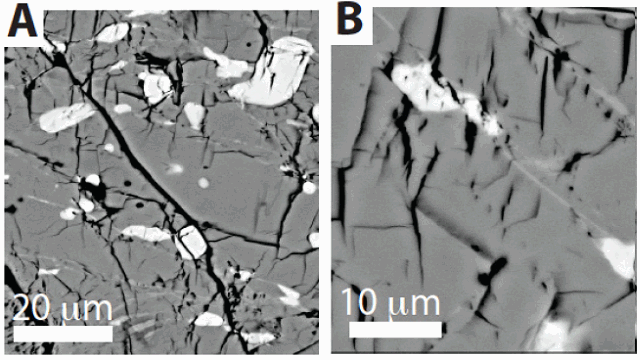 Another paper in the same issue of Science reported high-pressure experiments demonstrating just that in olivine, the most common mineral of the mantle. Squeezing things at high pressure is fairly easy in the lab, but squeezing a sample and deforming it at the same time at 1000°C takes our cleverest people and equipment. An international team led by Alexandre Schubnel of the Ecole Normale Supérieure in Paris not only did that, but reproduced microscopic versions of deep earthquakes in 3-millimeter cylinders of olivine. Faults (thin gray lines) in olivine. White grains are enstatite; note that some are split and offset along the faults. Part of figure S4 of Schubnel et al., "Deep-focus earthquake analogs recorded at high pressure and temperature in the laboratory," Science vol. 341, pp. 1377-1380. X-ray analyses showed them that about 5 percent of the samples had undergone a phase transformation from the olivine molecular structure to the spinel structure—exactly what is called for in deep earthquakes. It looked like a very clean result: "No evidence of melting or amorphous material was found at any scale, implying that the phase transformation was essentially instantaneous during fault propagation." They also detected sounds in the samples that correspond nicely with what we call earthquakes when they're a million times larger. When we seek to understand events deep in the mantle, techniques like those used in these two papers are all we have. It's a marvel when the progress we make is so clear-cut.